In difficult conditions, we achieved victory over Crewe last weekend with almost the minimum of fuss. After struggling to take hold of the game following Jonson Clarke-Harris’ opener, a Crewe equaliser would have been enough to derail many other previous iterations of Coventry City, but we were able to simply move up through the gears, regain the lead and see the game out with our opponents barely having a sniff of goal. The challenge, as it always has been this season, is now to replicate that standard of performance over a period of games. Exeter’s win over Port Vale on Tuesday makes our play-off place more precarious than it looked on Saturday evening, but an upcoming game against a Grimsby side that hasn’t won in 17 games should be the perfect opportunity to solidify our hold on a play-off spot. What was especially encouraging about the Crewe performance was that we spent much of the game closing down our opponents and threatening at times to completely overwhelm them. It’s where having a more mobile front pairing of Marc McNulty and Jonson Clarke-Harris comes into its own for us. With another game against a struggling side upcoming, that has to be the approach again. After both Liam Kelly and Tom Bayliss were arguably our best players on the pitch in different halves against Crewe, there is something of a conundrum in midfield. Bayliss was untouchable in the centre of the park for 15-20 minutes on a snow-covered pitch, while Liam Kelly played with a combination of aggression and composure that gave us more of a presence in midfield. 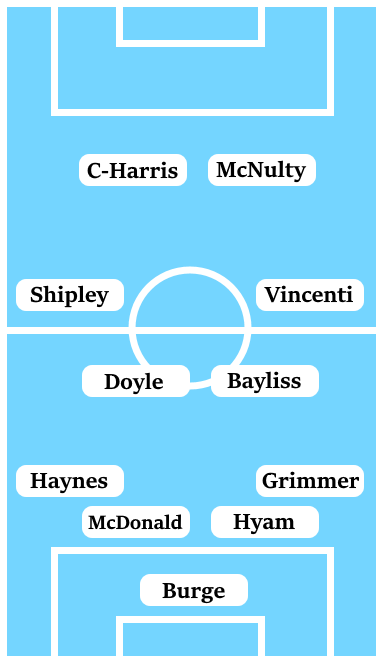 With Michael Doyle seemingly essential to either playing well, Robins has to make a call between the two, which surely has to be for Bayliss based on form over the past few months. While Jordan Willis is still getting back to fitness, the form of Dominic Hyam and Rod McDonald in defence will make it hard for him to get back into the team when he’s finally ready, because they were quietly brilliant against Crewe. In goal, I would expect Lee Burge to return to the side after recovering from illness despite a solid performance from Liam O’Brien – kicking the ball directly into the wind aside. Any threat of Russell Slade putting one over us with his new club started and ended when Slade stalwart Nathan Clarke placed a free-kick on the ground and lazily rolled it with his feet to his keeper, ignoring the presence of Marc McNulty who gleefully rounded Mariners stopper James McKeown and put the ball into an empty net. Should it have been allowed? Probably not. Was it a small dose of karma against two of the biggest culprits of our relegation from League One? Absolutely. The win was then sealed by Jack Grimmer heading in a Liam Kelly corner – one of four goals we’ve scored this season from set-pieces. Before seeing the three points out in the fairly typical comfortable manner that we’ve been able to do so when ahead this season. 17 games ago Grimsby were level on points with us and we were facing up to the ignominy of being overtaken in the league by a side managed by Russell Slade. 17 games later, things couldn’t be more different. Not only are Grimsby now 24 points below us and only one place above the relegation zone, but Russell Slade is long gone. Slade’s replacement, Michael Jolley, is a former city trader who worked his way into management despite having no professional playing experience. Grimsby are Jolley’s second managerial job, after a brief spell in charge at Swedish top-flight side Eskilstuna where he almost kept them up under difficult circumstances. Two games into life at Grimsby and Jolley has been unable to turnaround the slump. An encouraging late point won against Port Vale in his first game was undone somewhat by an emphatic 3-1 loss last week to local rivals Lincoln City. With Barnet’s appointment of Martin Allen likely to make the relegation battle tighter than expected, Jolley and Grimsby are in desperate need of a win. The squad left to Jolley by Russell Slade is almost desperately imbalanced. The defence is a collection of near-geriatric old stagers, with Nathan Clarke (34) and Danny Collins (37) still regular starters in central defence. Slade spent January offloading any and every midfielder of technical ability and adding loan strikers to the squad – they now have seven different strikers to pick from. Making sense of the squad appears to be Jolley’s biggest task at the moment, although he has added a left-back in Andrew Fox alongside ex-Sky Blues hero Gary McSheffrey. 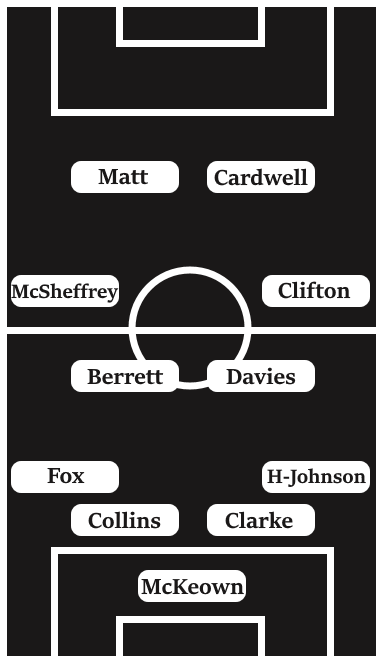 Predicting just what line-up and formation Grimsby are going to deploy is something of a mystery. The main area of interest is that Grimsby have a sum total of four ex-Coventry City players in their ranks, with McSheffrey and Nathan Clarke joined by Simeon Jackson and Charles Vernam – two of our more underwhelming striker signings in recent years. Additionally, they have the electric winger Siriki Dembele in their ranks who has the potential to be a game-changer in Grimsby’s favour, although he is recovering from a back injury and has not been in the best of form over the past few months. This game couldn’t be a more perfect opportunity for us to boost this momentum that we’re building. The main worries are that long winless runs such as the one Grimsby are on eventually come to end, and that these kinds of games can lead to an anxious atmosphere at the Ricoh if we don’t score within the first 20 minutes. Despite sitting just above the relegation zone, Grimsby don’t have to win this game and that only adds to the pressure on us to set the agenda here. We showed last week against Crewe that we can successfully set out to press weaker sides and exploit their lack of confidence, if we can replicate that type of performance, this game should present us with no problems. I’m backing us to do it, winning 2-0.